Now that things have returned to almost normal (I still have floors that need cleaning), I decided that I would do a bit of sewing. Actually, cutting and sewing. I remembered a lovely, easy baby quilt pattern that I saw and wanted to make. It's a free Craftsy pattern or you can get it HERE from this site. Star Bright is what it's called and it took more than a few hours to find the pattern yesterday. I searched my files and then, once I did find a copy of it, I realized that it was in my craftsy patterns. A couple of months ago, one of my daughter's friends brought over a box of fabric. They were from a lady who had passed away and since my daughter's friend knew I quilted, she asked if I'd like the fabric. One never passes up free fabric. It can always be used for something. This is the box with a whole lot of plastic bags filled with fabric. It's all yardage but it's also the older calico cottons that I don't often use. There are some lovely pieces in mauve that I plan on using to make some little girl outfits and there are fabrics that can be used in mystery quilts or donation quilts. I thought that some of these fabrics would work in the pattern that I had in mind. Most of these fabrics were from that box. I have cut enough pieces for two quilts in this pattern. That way, Marg and I can put two quilts up on frames next week and start quilting right away. We just need to find some backing fabric. 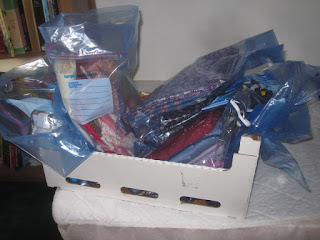 I'm linking up with Cynthia's blog this week. I hate turning down free fabric too, but have had to call a halt to the onslaught of denim I was getting. I simply couldn't use it fast enough and my hands don't like working with it anymore. Now I seem to be getting a lot of donations of white - wonder why that would be!! 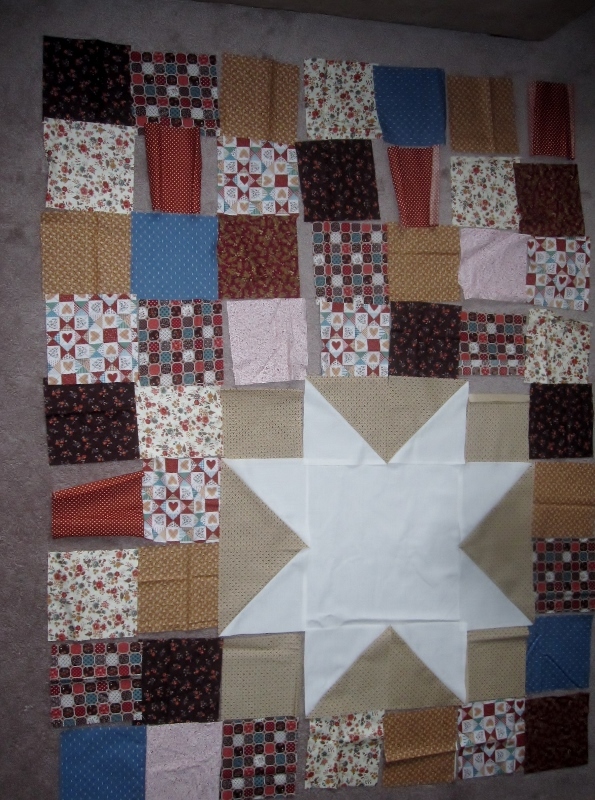 This is such a lovely pattern and you've done a wonderful job in creating a baby quilt from the donated fabric. 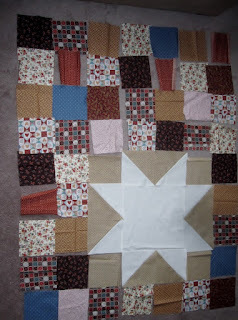 I like your layout of the star and the pretty patchwork around it! Great use of that free fabric. I love receiving scraps too. Thanks for sharing with Oh Scrap! You are making good use for those free scraps.